MAS development requires an appropriate methodology. 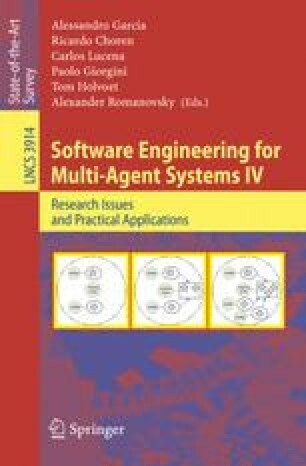 Rather than seek a single, ideal methodology, we investigate the applicability of method engineering, which focuses on project-specific methodology construction from existing method fragments and provides an appealing approach to organize, appropriately access and effectively harness the software engineering knowledge of MAS methodologies. In this context, we introduce a generic metamodel to serve as a representational infrastructure to unify the work product component of MAS methodologies. The resultant metamodel does not focus on any class of MAS, nor does it impose any restrictions on the format of the system requirements; rather, it is an abstraction of how the work product elements in any MAS are structured and behave both at design time and run-time. Furthermore, in this paper we validate this representational infrastructure by analysing two well-known existing MAS metamodels. We sketch how they can be seen as subtypes of our generic metamodel, providing early evidence to support the use of our metamodel towards the construction of situated MAS methodologies.